Here's another motorcycle trip that I took down the west coast from Vancouver Canada to California and back. 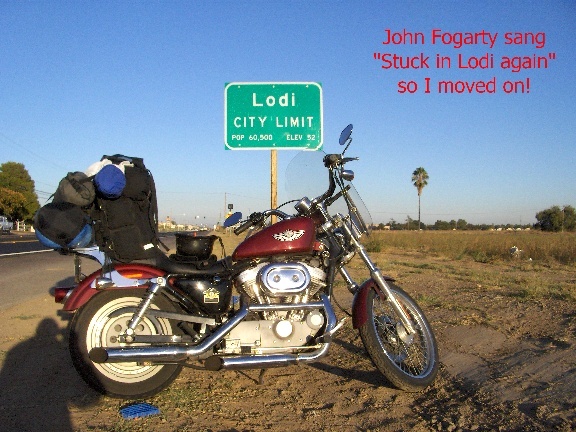 This time I was headed for a HOG (Harley Owners Group) rally in Modesto, California. However, as you will see, I did some other riding as well, like along the Extraterrestrial Highway - AT NIGHT! I also travelled a road that simply showed on my map as "The Loneliest Highway" and it surely was. Not only are there few gas stations, but there are very few towns and not very much traffic. The road surface, however, was great. The one thing that stood out in my mind after the trip was the contrast between the rainforrest where I live and the desert. What a difference a few days riding can bring! From The Rain Forest To The Desert And Back! 1) I travel The "Extraterrestrial Highway" and the "Loneliest Road" in the same week! 2) The difference between the rain forest and the desert. 3) Super motocross - these 10-year-olds are crazy! 4) I see the world's largest ride-able motorcycle. 5) I win an award and plaque at the HOG rally! 6) My rain jacket turns into a cape! 7) 6,304 kilometers or 3,917 miles in 13 days. I started this motorcycle trip at the crack of 11:00 am. (I'm going to have to plan better next time.) I did have a bit of an excuse this time however as my old fridge died the night before I was to head out. The good news was that there wasn't much left in it as I had eaten it clean before leaving anyway. The only problem was that food in the freezer was a mess. I was really glad that the ice cream was in a plastic pail and not one of those cardboard bricks! I unplugged it, salvaged what I could and transferred that to my neighbour, washed it out and left! The border wasn't busy and I was through in a few minutes, gassed up and headed south down I-5 to Olympia where I caught the road to the coast. I-5 is a really busy highway from north of Seattle through to Olympia but after that, the ride through the mountains and along the coast is great. It rained most of the night but stopped just before daybreak. I arrived in Modesto (site of the rally) at 7:00 pm - just in time for the opening beer and finger food festivities next door to the Harley dealership. After feeding my face for a while, I decided it might be prudent to find some place to live for the next 3 days and cornered the owner of the dealership for suggestions. It was like that for the rest of the weekend. As it turned out, I was the only rally rider to camp there! I guess they didn't get the word out in time. So, I became the token biker for the late night regulars and I couldn't buy a beer. They were only $1.75 but they wouldn't take my money! I joined a group for a 125 mile "Scrabble Run". (You collect letters at various locations on the run and then try and make the highest word score when you're done.) Harley riders and spelling - yeah right! Later that night, they had a chapter "air guitar" or karaoke contest which was a hoot. Some of the chapters put a lot of work into the costumes and choreography. You might have heard of motocross racing where the racers travel around a dirt circuit and end up airborne half the time in those big jumps. Well, Supermotorcross is a combination of pavement and dirt racing. At the end of the straightaway they do a U-turn on dirt into a couple of big jumps and another dirt corner and then back onto pavement for a road course back around to the straightaway. They must be doing 80 miles per hour at times and they drift the back wheel into corners like it was a car! And, they do all this while racing 12 or 13 other bikes! The kids were fearless and put on a great show. 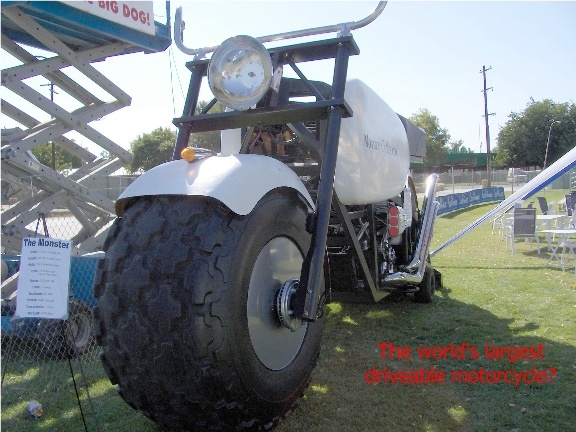 They also had the world's largest rideable motorcycle at the track (see my picture). However, nobody rode it while I was there! Maybe it's true? The person actually sits inside the bike where the gas tank is on most bikes. That night we had our Rally Dinner and they gave out awards. 2 people had come from Korea and 3 from The Netherlands and the Europeans won the "traveled the longest distance" plaque. When it came to who rode the furthest to get to the rally however, they seemed a bit confused and started asking the crowd "Who rode more than 800 miles?" I'm thinking, "How many kilometers is 800 miles?" At that point, I didn't know how many kilometers I'd ridden never mind how many miles, but when I realized that some guy from Tacoma was trying to claim the award, my gang of supporters around me raised quite a ruckus. Tacoma is south of Seattle and a good 100 miles south of White Rock where I left from, so I eventually convinced them that they should give the plaque to me! The VFW had a pancake breakfast for all rally participants and a few showed up. I resumed my motorcycle trip around 8:30 am but got lost trying to get out of town. If you're going north or south, you just jump on one of the interstate highways (5 or 99) but if you're going east (like me) it's really confusing. I actually ended up on Highway 99 south without trying! Anyway, about a half an hour later I was on my way east towards Yosemite Park. I retraced a few of the roads that we had ridden on the Scrabble run and then hit the park. According to the signs, the mountains in the park are granite and have risen over the millennia and are now shedding granite like an onion (horizontal sheets rather than vertical splits). All along the road through the park you keep seeing these humongous granite slabs and rocks just sitting poised above you waiting to fall and more below you that have done just that! I kept thinking, "When was the last tourist squashed along here?" Anyway, it was good riding even though it was a bit cool as I alternated between 7,000 and 9,000 feet for 3 or 4 hours. Then I crossed into Nevada! Keep in mind that the road I chose was the one that runs just above the air force bombing and gunnery range! Nobody in their right mind lives here. It's gravel and cacti and ordinance - period! The wind blows constantly and hard. You go for miles without seeing anything that looks like a human might have been there, except for the road. I was looking at my map at a gas station in town and it looked like a long stretch to the next major highway that looked like it might have a town or two on it. I asked a local if I could make it before dark. He said he didn't think I could and that it was pretty "desolate" out there! I asked if there were any gas stations between Tonopah and the highway and he said he couldn't recall any! So I "cruised" the town looking for a motel and found the only one there was called "The Clown"! It looked as bad as it sounds, so I headed for the desert! The only town mentioned on my map between Tonopah and Highway 93 (where I thought I might find humans) was Warm Springs and it was about 1/3 of the way, so I thought I'd head for there and then decide where to go or what to do. 45 minutes later I found Warm Springs. It consisted of a bar/restaurant that looked like it closed its doors 30 years ago. There was no gas station! There was no "anything", just a highway junction and the only highway that went south and east (the way I had to go) was The Extraterrestrial Highway! That's the name on my map and the name on the road sign. I guess this is where the flying saucer was supposed to have crashed back in the 40's that the government allegedly scooped up and hid so as not to scare the populace. I had no choice. I took to the highway. So, I decided I'd better camp right where the roads joined. There were 2 trees and some road paving equipment in the V between the roads so I decided that was going to be home for the night. I threw the tent out and found that the ground was so hard that the pegs wouldn't go in. So I found 2 big, dead branches and used them for anchors for the tent and crashed, (home sweet home). Apparently, they missed me so I inquired about gas and she said that the next station was about 6 miles away, so I headed off. I put well over 3 gallons of gas in my 3.2 gallon tank so I was pretty close to being marooned the night before which would have turned this into the motorbike trip from Hell! The highway went south toward Las Vegas and I turned east off it about a half hour north of the city on another gravel and cacti ride to I-15 which would take me north to St. George, Utah, my destination. I got to St. George around noon and looked for my friend at his hotel but he was out playing baseball with his team in the World Senior's Games, so I headed out to the Harley Davidson Dealership to say hi. I had met the manager last year when I was at the Utah HOG rally in Panguitch, about 3 hours east of St. George. He found a replacement headlight for me during that rally when there was no Harley dealer anywhere near the town and actually installed it for me as well. The campground was actually an RV park and was perfect. It even had a pool! By the time my pal called me; I had set up camp and had a swim. That evening buddy's team had organized a catered "Thanksgiving" dinner at their hotel and they invited me along. It was excellent. After the game, a few of the players headed for The Grand Canyon which is about 2 hours away. I declined. (I was there last summer and I had seen my share of rocks and canyons the last couple of days anyway.) So, I headed back to the Harley dealership again and Boyd (the manager) was in so I had a nice visit with him. He remembered putting in my headlight last year. I spent the rest of the day around the pool and watching volleyball at the Games Center. That night, my friend and his girlfriend and I went to Chili's, a Mexican restaurant, for supper. Because they lost yesterday, the baseball team had to play at least 2 games today at 9:45 and 10:30. My pal's girlfriend had to fly out of Las Vegas around 11:00 am so I volunteered to drive her to the Vegas airport and missed the games. (That way my bud could play!) There was an accident in the tunnel leading into the airport so there was a delay getting into the place but we left in lots of time so she made her flight. My pal and I watched Chicago and New York in a playoff game on TV and dined on pizza. The rest of the team went to a smorgasbord which is American for "eat way too much" so we declined the offer to join them. Unfortunately, I had to resume my motorcycle trip today in order to get back home in time for work on Monday so I missed all the rest of the games! I think they played 6 and won them all except the last one! (They just ran out of steam. They're seniors, after all.) Oh well, a silver medal is a terrific result. Congratulations guys! The scenery was much better - dried weeds and mountain passes - however, on my map it is listed as simply "Loneliest Road" and it surely was. I filled the gas tank up at the 3 towns I came to over the next 5 hours and if I had missed one, I could have been stuck in the middle of nowhere for hours. What do the people do that live in those towns? There is no evidence of farms or side roads or anything. Next time I'll have to try it at night for some extra excitement! Near the end of the highway was Reno and I started looking for campgrounds when I got near the city but didn't see any. So, by the time I got there, it was dark. I stopped at a couple of gas stations and asked about campgrounds but the clerks just looked at me like I was speaking a foreign language. (I guess to them I was!) So, I headed north out of the city and stopped again at another station. This time, one of the customers said, "There's a KOA right behind The Hilton in town." I had noticed the hotel on the way through town earlier, so I headed back. I stopped at a gas station near the hotel and got simple directions to it but couldn't find it. (I did pass an RV park however.) So, I stopped at another gas station. (Too bad I'm not a "mystery shopper" for the gas companies. I'd have lots to report!) I got more directions to the KOA only to decide that they were all mistaken and it was really the RV park they were trying to direct me to. The park didn't have any space for tents and the office was closed when I pulled in anyway so I knew that they were going to be no help to me. It was then that I noticed I was standing on the bank of a river and there seemed to be a city park running along the bank! There was even a washroom there. It was 9:30 pm. I was tired. Setting up a tent in a city park may be against the law but at that point, I didn't care. It was on the bank opposite the downtown so nobody was likely to bother me anyway. I found some grass under some trees and set up the tent. I was tired, but not too tired to realize that any grass in this neck of the woods was only there because it was watered regularly, so I put on the rain cover even though there wasn't a cloud in the sky. That turned out to be a great move because about 2 hours later, the sprinklers came on! I knew they would. I just didn't know where they were until then. The only other drawback to the site was the jet airliners that seemed to skim the top of the tent on their way to Reno's airport, about a half a mile away. Sometime after midnight the frequency of landings diminished and didn't really start again until daylight, but I had to leave then anyway. Oh well, the price was right! It was. It was the best motorcycle road I have ever been on! (They probably take motorcycle tours along here.) The first sign I saw was one of those wiggly arrows and underneath it was a sign saying "For 140 miles". I spent hours going up and down through the gears and leaning the bike left and right. I had so much fun that I just lost track of time. I had to stop halfway for a rest. What a blast! I did slow down at one point however, as I came upon an ambulance that had just loaded somebody from a "rice rocket" that had obviously been going way too fast in a curve. (The front wheel was missing from the bike which was still lying on the road.) You can have lots of fun on this road but you have to stay on your side of it! I hit the coast and Eureka around 6:00 pm and headed north up highway 101. I had noticed as I approached the coast that there seemed to be a large black cloud bearing down on me from the north so I stopped for gas and to check the forecast. The lady inside said they had been expecting "rain, big time" since 3:00 and as she said that, it started to sprinkle. I went back to the bike and put on my rain gear as it started to pour. I started talking to a biker who was filling up his pickup next to me. I asked him where the nearest motels might be and he directed me south again about 10 miles so I backtracked. I actually outran the rain and found a Motel 6 before it started to rain there. By the time I checked in however, it started to pour and didn't quit until about 7:00 the next morning! I left around 8:00 am with all my raingear on and the roads were wet but it was warm and although it rained once in a while, it wasn't a problem. I was trying to get through Oregon to Washington that day but didn't quite make it. It got dark by the time I got to Tillamook, Oregon which is about a half an hour from the state line, so I found a Best Western and booked in. (I might have made it to Washington actually, but there was an accident on a winding stretch of Highway 101 that led down to the beach and we were delayed for at least a half an hour.) It's only a 2-lane road and they were only letting a few cars through at a time. I shut off the motor and coasted down to the accident scene. By the time we arrived, they had pulled the cars out of the way and on to a beach access road. It looked like a rear ender. Anyway, I got to watch and listen to the angry surf pound the beach while we were waiting. That storm really riled up the ocean. I left Tillamook about 8:30 am after a "continental breakfast" at the hotel and although I had raingear on, the sky was blue! That lasted until I reached Washington and from there on it was off-and-on rain for the rest of the day. Fortunately, it cleared up as I went through Seattle and the roads were actually dry. Traffic on I-5 however was horrendous even on a Sunday afternoon. Fortunately, they have an HOV lane for busses and commuters with 2 or more passengers and motorcycles, so I stuck to that for many miles and it kept me out of the "NASCAR lanes". The worst rain of the motorcycle trip occurred just south of Bellingham which is about 30 miles from the border. I think it was because it was getting colder by this point plus, my rain jacket decided to become a cape at one point as the zipper started to undo from the bottom up. I fought that sucker for the last few miles to the border. The border guard must have felt sorry for me because he virtually waved me through and I was home by 4:30 pm. 3,917 miles in 13 days - another adventure in the books! Click above to read about my first motorcycle trip and its misadventures. Before I had my "toyhauler" trailer, I used to pack up my motorcycle with a tent and go travelling around North America in the summer. A couple of times I took a video camera with me and you can catch those fun trips by clicking above. Want more travel related tales? Click above. Click below to find out how to make money with a travel site.